Is that a mobile pizza oven? Looks to me like an A/C unit off a small office building. Can't be very fuel-efficient huh? 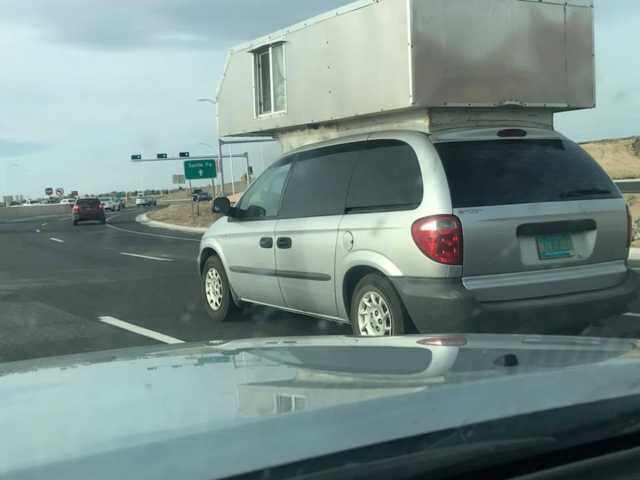 It's very fuel efficient. That poor, weak Caravan transmission is going to give up any minute if it hasn't already and then the van, or whatever that is, will not use much fuel at all. I think a reman transmission was listed as part of the Dodge Caravan 60k service! Have you seen the purple "Jucy" rental vans out of the road or in campgrounds? This contraption looks like a home brewed version of that. Oh yeah, Jucy vans! I forgot about those. I haven't seen one in a couple years. Except that there's real thought that went into the Jucy vans. Gaudy paint job aside, whoever put those together knew not to go nuts on weight or wind resistance. The thing above makes me wonder how someone capable of pulling it off decided that it was a reasonable thing to do. I had just finished a 10 mile drive on an extremely washboard road (worst I've ever seen) in the middle of nowhere, and had just hit pavement before coming back to the highway and was pulled off to the side planning the drive for the next leg. I saw a Jucy van come up the same washboard road and onto the pavement. The van stopped, the guy got out, walked around to the front of the van, knelt down and kissed the pavement, then got up and back into the van and drove off. One of the funniest things I've ever seen. Sorry for the random flashback.